Sam is the grandson of a world-renowned space adventurer. Marvelled by his ailing grandfather's stories of interstellar travel and alien romance, he models his life after these tales - even though they may be untrue. So focussed is Sam on fulfilling what he thinks is his natural destiny in life that he becomes blind to his own reality. John Martz is a cartoonist and illustrator in Toronto, Canada. He is the creator of the wordless online comic strip Machine Gum, and the illustrator of several picture books including an adaptation of Abbott & Costello’s Who’s On First? In addition to his contribution to Nobrow 6, his comics and illustrations have appeared in The Globe & Mail, MAD Magazine, Maisonneuve, Canadian Notes & Queries, and ku! He was a founding editor of the illustration blog drawn.ca and makes up one quarter of the jam comics collective Team Society League. He won the 2013 Ignatz Award for Outstanding Story for his comic book Gold Star. "John Martz's atomic-age cartooning is joyously stylish and deceptively simple. I've followed and admired each of his projects over the last few years but this new book is undoubtedly his best. Funny, sad, surprising...and laced with a charm that is all his own." "He uses a uniquely measured combination of humour and brevity that results in meaningful, entertaining stories that never become grandiose or mired in their own seriousness. 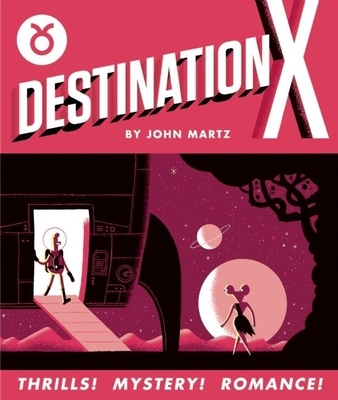 […] Reading Mart’z work is always a singular pleasure and Destination X is no different: a funny, neat and nuanced tale, nicely offset by the galactic feel of the purple toned hues and clear line style. I greatly enjoyed reading this, and have no doubt that you will, too." "Destination X is a good read, and surprisingly big, in terms of intellectual scope: obsession, sexual repression, wilful social blindness, madness, rage… If you’re looking for a short indie comic book, I’d happily recommend this. Go." "Martz tries to keep the story short, and he manages to convey character masterfully in a quick manner."